Update, 1:00 p.m. Wed. Oct. 10: A federal grand jury has indicted four California men on conspiracy and rioting charges in connection with a torch-lit march and a rally of white nationalists in Virginia last year. U.S. Attorney Thomas Cullen's office announced the indictment Wednesday. It came eight days after the arrest of the four defendants. Prosecutors say the men were members of the Rise Above Movement, a militant white supremacist group that trains in fighting techniques. They are accused of committing violent acts during an Aug. 11, 2017, nighttime march at the University of Virginia and during a larger rally in Charlottesville the next day. All four made initial court appearances in California last week. The press release says they're expected to be transferred to Virginia, where they will appear for arraignment and additional proceedings. Original Post, Tues. Oct. 2: CHARLOTTESVILLE, Va. — Four members of a militant white supremacist group from California were arrested on charges of traveling to Virginia last year to incite a riot and attack counterprotesters at a white nationalist rally that turned deadly, federal authorities said Tuesday. The affidavit alleges the four were "among the most violent individuals present in Charlottesville" in August 2017 during a torch-lit march on the University of Virginia campus and a larger rally in downtown the following day. It says photos and video footage shows they attacked counterprotesters, "which in some cases resulted in serious injuries." The men have also taken part in "acts of violence" at political rallies in Huntington Beach, Berkeley and other places, the affidavit alleges. One of the men — Cole Evan White — is a former employee of the Top Dog restaurant in Berkeley. 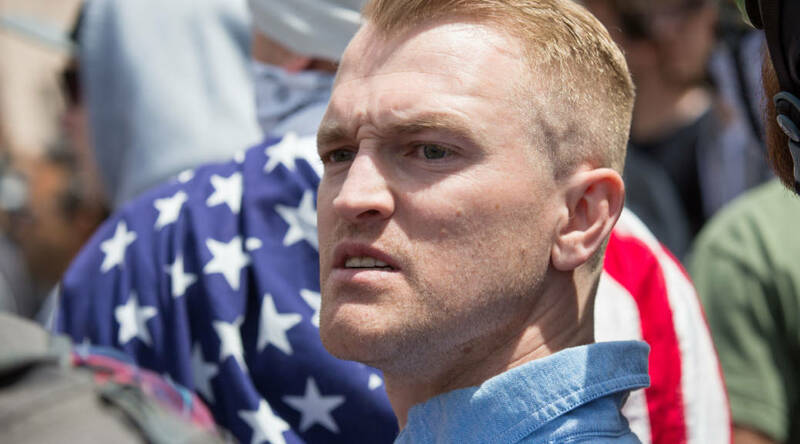 White was also involved in previous white supremacist rallies that turned violent, according to Emily Marshall, who said she was assaulted by him at a Berkeley rally in April, 2017 after she had been punched in the face by Nathan Damigo, a leading white nationalist in California. Damigo is not among the four men arrested this week over the violence in Charlottesville. "This is a group that essentially subscribes to an anti-Semitic, racist ideology, and then organizes, trains and deploys to various political rallies, not only to espouse this particular ideology but also to engage in acts of violence against folks who are taking a contrary point of view," U.S. Attorney Thomas Cullen said at a news conference in Charlottesville held to announce the charges. All four men were arrested early Tuesday morning, Cullen said. Three of them — Daley and Gillen, of Redondo Beach, and Miselis, of Lawndale — were expected to make initial court appearances later Tuesday, while White, of Clayton, was due in court Wednesday, he said. It wasn't clear if the men had attorneys who could comment on their behalf, and attempts to reach their relatives were not immediately successful. Cullen said each defendant faces up to 10 years in prison if convicted on the two counts they each face: traveling to incite riots and conspiracy to riot. However, defendants often get less than the maximum under federal sentencing guidelines. Clashes erupted Aug. 11, 2017, as a crowd of white nationalists marching through the University of Virginia campus carrying torches and chanting racist slogans encountered a small group of counterprotesters. 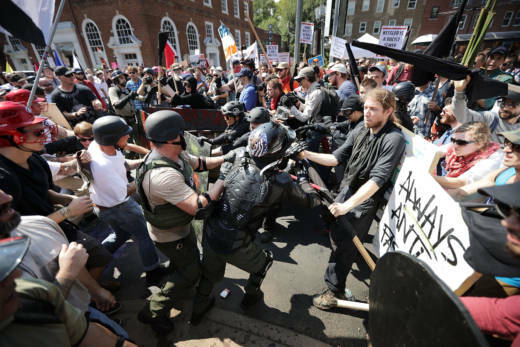 The following day, more violence broke out between counterprotesters and attendees of the "Unite the Right" rally, which was believed to be the largest gathering of white nationalists in at least a decade. Street fighting exploded before the scheduled event could begin and went on for nearly an hour in view of police until authorities forced the crowd to disperse. Cullen said investigators sifted through "an incredible volume" of video and still photographs to review the movements of the four men and determine whether they could claim they were only defending themselves after being attacked by others at the rally. He said prosecutors believe there was "no provocation" for them to engage in violence that day. The four, he said, went to the rally with their hands taped, "ready to do street battle." "In our view, these four committed particularly violent acts in Charlottesville. Secondly, they committed violent acts in California at other rallies. Therefore, in our view, they were essentially serial rioters," Cullen said. According to the Anti-Defamation League, Rise Above Movement members believe they are fighting against a "modern world" corrupted by the "destructive cultural influences" of liberals, Jews, Muslims and non-white immigrants. Members refer to themselves as the mixed martial arts club of the "alt-right" fringe movement, a loose mix of neo-Nazis, white nationalists and other far-right extremists. "They very much operate like a street-fighting club," said Oren Segal, director of the ADL's Center on Extremism. The group has roots in the racist skinhead movement in southern California, Segal said. Daley figures "prominently" in the organization, according to the affidavit, which also cites news organization ProPublica's efforts to identify Rise Above Movement members involved in the violence by reviewing video footage of the clashes. The news outlet reported in July that the group was founded in early 2017 and had a relatively modest core membership of 15 to 20 young men. ProPublica and Frontline also reported in July that Miselis was a member of RAM, worked as an aerospace engineer at defense contractor Northrop Grumman's facility in Redondo Beach and held a government-issued security clearance. A company spokesman later said Miselis was no longer employed by the company but didn't say whether Miselis was fired or resigned. 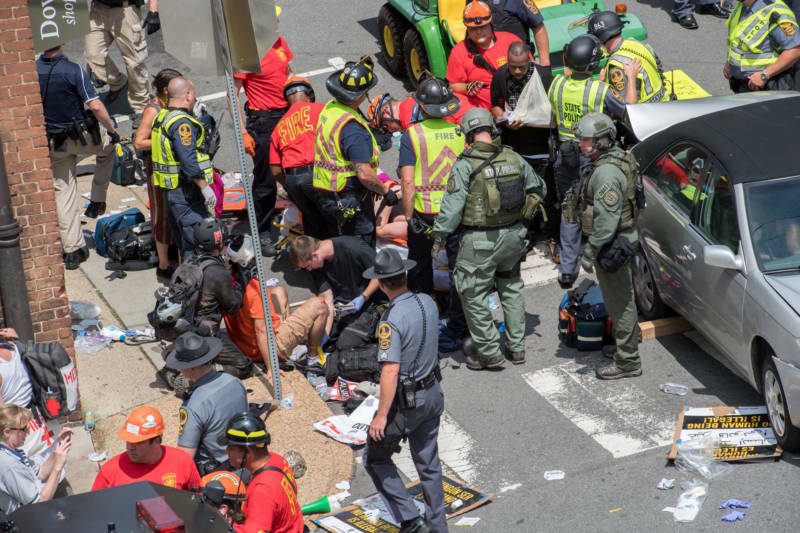 After authorities forced the rally to disband on Aug. 12, a woman was killed when a car that prosecutors say was driven by a man fascinated by Adolf Hitler plowed into a crowd of peaceful counterprotesters. This post features reporting from Denise Lavoie and Michael Kunzelman of The Associated Press.